Fog Creek Software, a small but well-known software company in New York, released Manuscript, a new tool to help programmers track bugs and new features. Manuscript is taking on Atlassian Jira, a mega-popular bug-tracking tool. Unlike Jira, though, Fog Creek designed Manuscript to encourage programmers to act ethically and take responsibility for their software. As Big Tech gets ever bigger, so too do the ethical issues raised by its products. For every problem technology seemingly solves, it also seems to pose us with new dilemmas or challenges. Just in the recent past, we’ve seen everything from state-sponsored Yahoo hacks, to white supremacists embracing YouTube, to Facebook knowing too much about its users for their comfort. 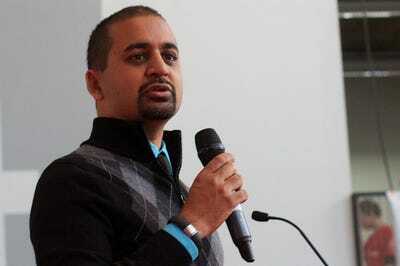 Fog Creek Software CEO Anil Dash has been mulling tech’s bigger pictures problems for a while now. On Tuesday, his company is launching what it sees as at least a partial solution to such challenges: Manuscript, a new bug-tracking application. 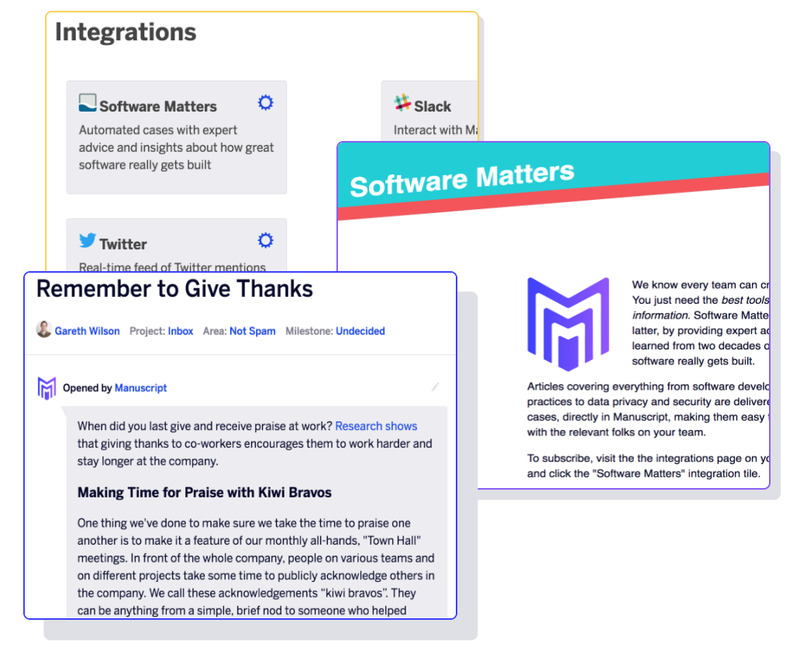 Like Jira, the mega-popular bug tracker from Atlassian with which it will compete, Manuscript allows developers to keep track of the everyday flaws found in their software. But Fog Creek’s new application is designed to also get developers to think about and take responsibility for the bigger issues raised by their applications, whether those have to do with privacy, security, or ethical considerations. The programmers at Volkswagen who designed the software that allowed the company’s cars to fool emissions tests likely tracked and fixed the bugs in it, Dash said in a Medium post. But they obviously weren’t thinking about the bigger ramifications of what they were doing. “If technology is actually negatively affecting the air that we breathe, then maybe we need to think bigger about the way we craft software these days,” Dash said in his post. Medium tries to encourage that bigger picture thinking through accountability and advice. The program puts a single developer in charge of solving particular bugs. And it offers suggestions on how to make better software. 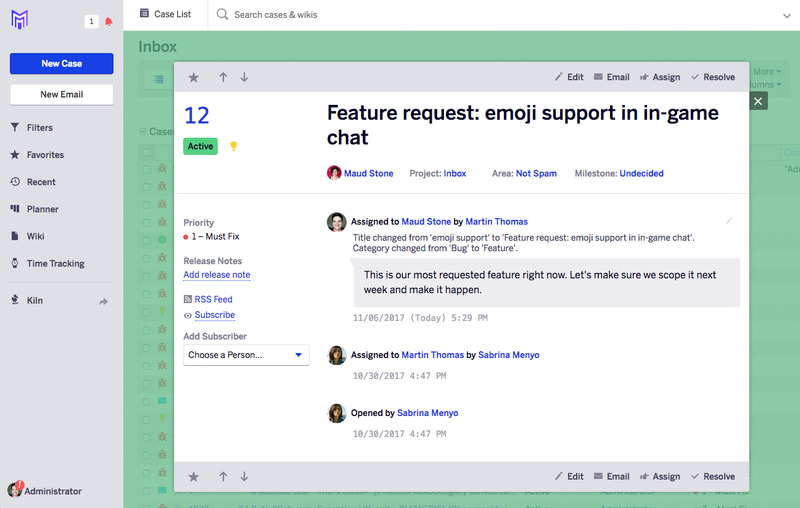 Overall, the new bug tracker is designed to make teams of programmers more thoughtful, more considerate, and ultimately, more accountable to themselves and their customers, Dash told Business Insider. As tech becomes more important to the world, Dash wants to offer tools to help the people creating the technology do so in a smarter and more ethical fashion. “If software is eating the world, it’s developers who are doing the chewing,” said Dash, a former digital advisor to President Obama’s White House. Fog Creek SoftwareThe Manuscript interface. Based in New York, Fog Creek may not be a household name, but it’s well-known in programmer circles. Its biggest successes to date has been Stack Overflow, a kind of forum site millions of developers rely on to get answers to programming questions. 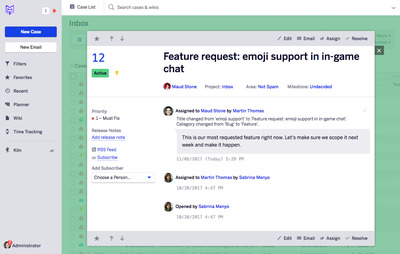 It also launched Trello, a popular project management app. Fog Creek spun off both products; Atlassian snapped up Trello for $US425 million earlier his year. Fog Creek’s primary product lately has been Glitch, an online programming tool it launched earlier this year. 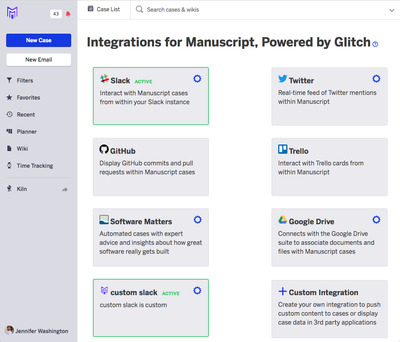 Designed to encourage people to code, Glitch makes it easy to fiddle with pre-existing programs and see how they work. But Fog Creek, which has gotten by without any venture-capital investment, has a long history in the bug-tracking business as well. The company first made its name in 2000 when it launched FogBugz, a still-popular bug tracking tool that’s used by 20,000 programmer teams. Indeed, Manuscript is built on the same core technology underlying FogBugz, but with a slicker and more modern interface. When developing and revising software, programmers typically focus on smaller, more specific problems, like a feature that’s not working or an interface that’s difficult to use, Dash said. That’s in part because that’s how most bug tracking software is organised, he said. When a bug report is submitted, it goes into a figurative pile. To demonstrate productivity, developer teams frequently prioritise easy or fast fixes. The problem with that approach is it encourages developers to ignore the bigger issues raised by their software, issues that may not have easy answers or fixes, but can have large-scale impacts on society, he said. Such issues includes not just security and privacy concerns, but also ethical considerations, such as those raised in the Volkswagen emissions scandal, Dash said. There’s a culture in the technology industry where these big issues become somebody else’s problem, he said. Instead of addressing them, programmers just go with the flow and fix the little things. “The process is overtaking the end result,” Dash said. Fog Creek SoftwareIf enabled, the ‘Software Matters’ bot will give advice on how to build better, smarter software while you’re writing it. Manuscript is designed to focus programmers on those bigger considerations in two notable ways. When a bug is filed in its system, Manuscript assigns it to one particular person. It does that to foster accountability. If a problem is assigned specifically to you, you can’t ignore it or figure it’s someone else’s responsibility. And assigning a particular class of bugs — security-related ones, say, or those involving privacy — to a particular person can also result in higher productivity. It can help make clear who’s responsible for what, even if that person turns to others for help in fixing problems. The other thing Manuscript does to encourage bigger picture thinking is it offers advice on how to build better software. If you’re working on a way to store user data, Manuscript can give some tips on on how to do that responsibly. That advice is drawn from Fog Creek’s 17 years of building its own software, Dash said. Fog Creek’s “experience” is “the thing that we can bring to bear,” he said. 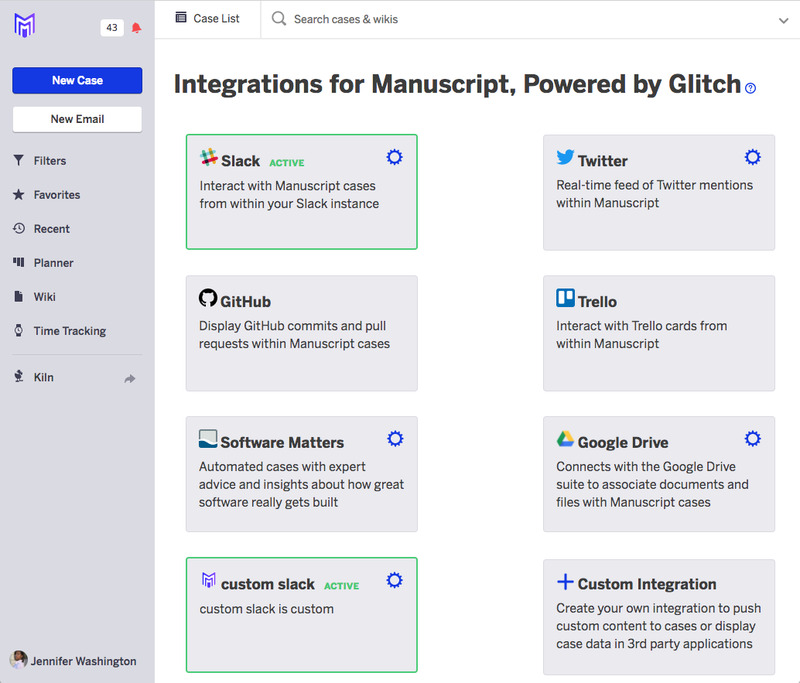 Fog Creek SoftwareManuscript offers a bunch of integrations with services like Twitter, GitHub, and Google Drive. If you need one that’s not on the list, you can write your own with Glitch, Fog Creek’s simple code-writing tool. Fog Creek has its work cut out for it trying to compete with Jira. That bug-tracking system is so popular, even actress Jessica Alba is a fan. But Dash thinks Manuscript will stand out from Jira — and not only for its focus on bigger picture concerns. 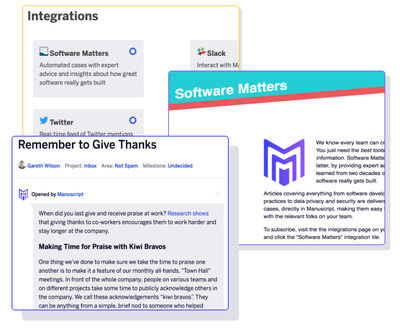 Atlassian is pushing Jira for use in other corporate departments beyond software development, including in legal, sales, and marketing areas. By contrast, Manuscript is totally focused on programmers, Dash said.